Risotto, a traditional Italian rice dish, has a reputation for being difficult and time-consuming. While it’s true risotto waits for no one, the technique is simple. Once you do it, I hope you’ll find it as fun and relaxing as I do. Risotto is generally made with Arborio or Carnaroli rice. Both are short-grain varieties that absorb a fair amount of liquid and turn creamy when cooked. Arborio is available at most area grocery stores. Look for Carnaroli at The Fresh Market, Whole Foods and other area specialty stores. After softening onion, shallot or other aromatics in plenty of fat, the rice gets added and is cooked until slightly translucent. It’s at this point you may want to just relax and perhaps turn on a cooking show on a nearby television because you’ll be at the stove for a while stirring the risotto. If you are using white wine, it should be warmed, or at the very least room temperature — not cold directly from the refrigerator. The stock should also be heated. Adding cold liquid to the rice will have an adverse effect on the texture and cause it to cook unevenly. After the wine has evaporated, add the broth in increments, stirring slowly and constantly after each addition until it is absorbed. Like pasta, risotto should be cooked to an al dente stage, which means “to the tooth” in Italian. When properly cooked, the kernels should still be somewhat firm. The required amount of broth to rice is generally 4 cups of broth to 1 cup of rice. You may need less; you may need more. If you run out of broth, just use water. Risotto can be used as the base for almost any combination of meat, seafood, poultry or vegetables to create a satisfying and comforting main dish. 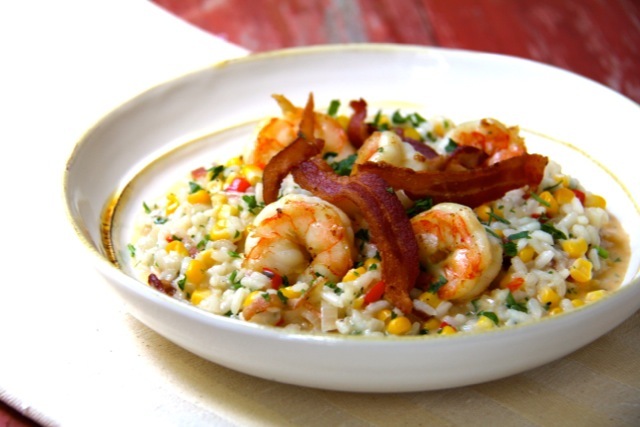 Here, risotto takes an American twist with bacon, wild-caught shrimp and corn. All you need is a tossed green salad to complete the meal. Place broth in a saucepan and bring to a simmer. Reduce heat to low and keep warm. Cook bacon strips in a sauté, frying or other shallow pan over medium heat until crisp. Transfer to a paper towel-lined plate, reserving bacon drippings. Crumble half of the strips into small pieces. Reserve remaining strips for garnish. Add shrimp to bacon drippings and cook 1-2 minutes per side or until pink and firm. Transfer to the plate with the bacon. Wipe out pan. Heat butter and olive oil over medium-high heat. Add the onion and reduce heat to medium-low. Cook the onion 4-5 minutes or until softened, being careful not to brown the onion. Add the red bell pepper and cook 2-3 more minutes. Stir in the garlic and rice and cook 1-2 minutes, stirring slowly but constantly, until the rice is slightly translucent, being careful not to brown it. Add the wine and cook, stirring until evaporated. Add the chicken broth in stages, about a full soup ladle at a time and continuing to stir until the rice is creamy and has reached the al dente stage, about 18 to 20 minutes. Stir in the crumbled bacon, shrimp, corn kernels, half-and-half, cheese and parsley, and heat through. Adjust seasoning with salt and black pepper to taste. Garnish with bacon strips. Serve immediately with more grated cheese if desired. I made this last night and it was a ginormous hit! My wife and friend couldn’t stop going on and on about how delicious it was. It will probably be a staple in our house. I didn’t use the cream since I have a dairy allergy and I used a strong parmesan reggiano instead of the asiago because that’s what I had (and it’s manageable with my allergy) and it worked very well together. Oh, also used some mini sweet peppers instead of the red pepper and dried parsley instead of fresh. Yeah, so good. Thanks for posting!